Patination refers to the process of developing or forming a colour upon a surface or sculpture. A patina can be thought of as a desirable, protective or even decorative tarnish or finish. This is most commonly seen on works of bronze or copper. On copper, it is especially distinctive- often taking the form of a light green finish. In essence, the process of patination is similar to rusting- however, it is in fact a beneficial process for most sculpture whereas rusting typically is not. A patina is either naturally formed via age, wear and weathering or by application of chemicals to artificially stimulate the process. Neither a natural or artificial patina is inherently better than the other, as fundamentally they are the same chemical process. When induced artificially however, it is much quicker and easier to produce the desired results. Artists may wish to patinate their works for a number of reasons. For example, when used alongside waxes patination acts as a protective layer on the sculpture- a layer of surface weathering which prevents deeper intrusion of corrosion. Additionally it is often part of the desired look of a piece- giving newer works an aged or antique look for example. 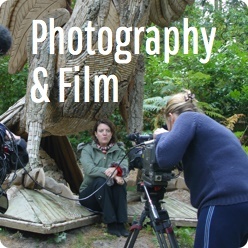 It may also simply be part of the artist’s intent for their work that it is finished in a particular manner for aesthetic reasons – perhaps using differing coloured patinations to highlight aspects of a work, or using a contrast between patinated and un-patinated areas to create a certain effect. 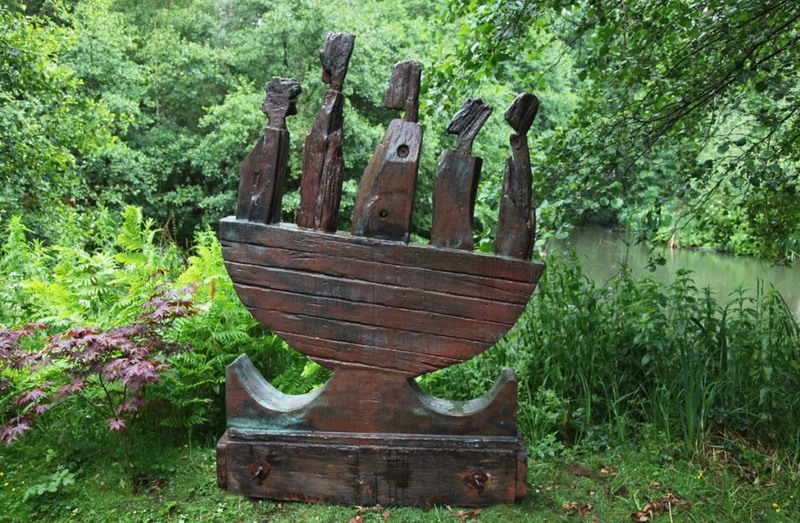 Stalik Boatman by Helen Sinclair - Showing the variation in colour within it's patina. Most metals can be patinated using modern patination techniques and chemicals. Most commonly, sculptures made from copper or bronze are patinated in a manner that mimics their natural weathering. Copper for example will become a pleasant green-blue over time, and bronze will often turn a brown-green if left to weather and oxidise. If this process is done with the intent of simulating aging it may sometimes be called ‘distressing’. Steel or iron works may also be induced to rust, using various oxidisers, for aesthetic purposes. Modern tools and techniques available to artists do also permit patination in a number of other more unusual colours beyond those of typical natural weathering, but this tends to be less common. Whilst most metals can be patinated individually, it is often unwise to patinate works that feature different metals that touch surface to surface. For example, bronze may corrode other materials if mounted in contact with other certain metals. 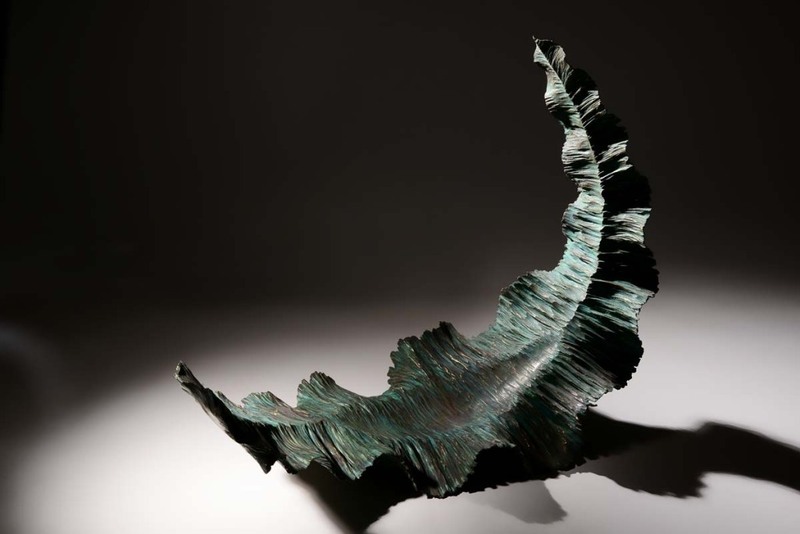 This effect can be especially pronounced if the bronze is patinated, and potentially compromise the finish or integrity of other metal contacting or supporting the piece. As such, when metal pieces are installed it is important to consider the potential interaction of the piece, its finish, and it’s mounting or base. 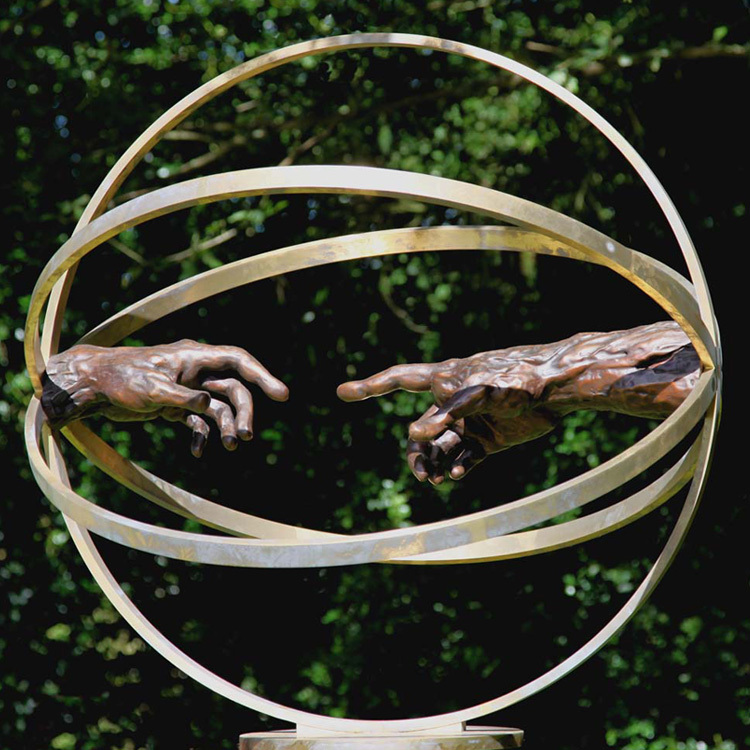 Here we can see the contrast created between exposed polished metal, and the brown patina of the two hands at the centre of this piece. When done correctly, patination can be a great tool for an artist wishing to add another dimension to their works. It services both the role of protecting it from the elements and deepening their ability to express their artistic intent. For existing works, it can also be used as a restorative procedure to help revitalise or renew a piece and can often help present the material of a sculpture in a whole new light. For artists wishing to protect their pieces, wax will be applied to add a further weatherproof layer and enhance the finish of the sculpture. Waxes are as varied in their function and application as patinas themselves, and so are best covered in depth in another article. This entry was posted in and tagged sculpture, Bronze, helen sinclair, patination on 12th January 2019 by Charlie.